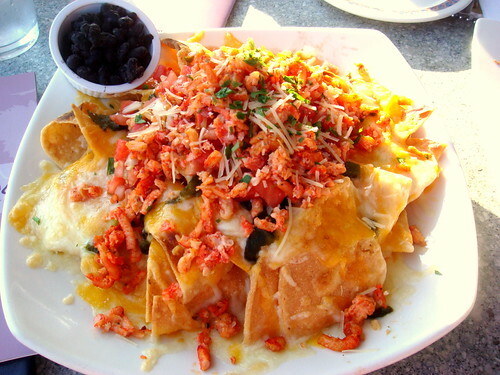 Lobster Nachos, a photo by Mike Saechang on Flickr. Perhaps this is something which I am getting wrong, but when St. Paul was speaking about knowing how to live in humble circumstances, as well as how to live with abundance, I didn’t think he was solely talking about his contentment with his daily fare regardless of it was lobster nachos or stale Cheerios set before him, (Philippians 4:12). Rather, I thought he was speaking of a balanced view of life, and the way in which we should strive to live. Meaning, that if I was in a position where lobster nachos was my de rigeur, I should work to maintain my humility, and recall that my abundance is a gift from God and not something which I earned, or worse, that I am entitled to. I should always keep in mind my brothers and sisters who do not have food in abundance(or other necessity of life) and work to see to their comforts as best I can. On the other hand, if I am living in humble circumstances, I am not to fall into despair, but to trust in the Lord that He will provide for me. I am to be joyful for the things that I have and offer up my small sufferings for the good of my brothers and sisters in Christ. In either circumstance, I would know that my worth is not measured by the things I own, but by the way I live in Christ and the example I can show to others in my living out of the Gospel. Previous What a Beautiful Morning!